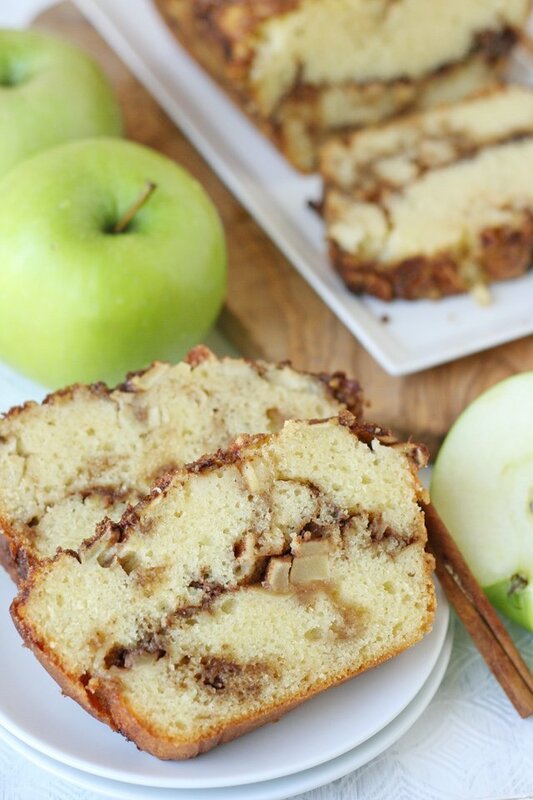 Let’s kick off the fall baking season with this flavorful and delicious Apple Cinnamon Bread! It’s still quite warm here in California, but I’m ready for fall baking and this loaf bread was the perfect kick off! 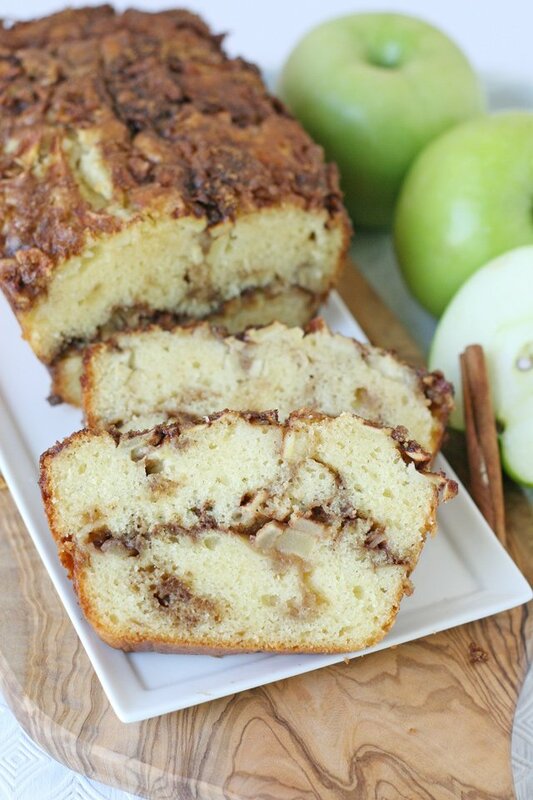 Apples, cinnamon and sugar… flavors that are delicious all year round, but seem extra perfect for fall. And even if I’m still running the air conditioner… the fragrance in my house while this cake was baking was pure fall! This recipe starts with a simple vanilla cake base and then gets a generous helping of fresh apples, cinnamon and sugar. 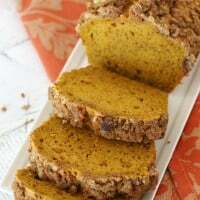 Simply the perfect fall recipe! 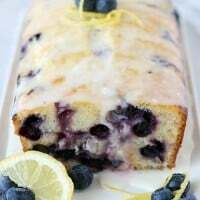 Moist, flavorful and delicious! Grease and flour a 9" x 5" loaf pan, and/or line with parchment paper. In a small bowl, combine the brown sugar and cinnamon, and set aside. In the bowl of an electric mixer, beat butter until smooth, then add white sugar and continue to blend until fully incorporated. Slowly add flour, baking powder, salt and then milk, and blend just until all ingredients are well combined. Do not over-mix. Top batter with half of the diced apples, and half of the cinnamon sugar mixture. Press apples and cinnamon sugar into the batter just a bit (with the back of a large spoon). Pour the remaining batter on top of the apple layer (spread as needed), then top with remaining apples and remaining cinnamon sugar. Again, press the apples and cinnamon sugar into the batter a bit. Bake for 50-55 minutes, or until a toothpick inserted in the center of the loaf comes out clean. Cool in the pan for 15 minutes, then transfer loaf to a cooling rack to continue cooling. I used Challenge butter in this recipe, but please feel free to use a high quality brand of your choice. These pics have my mouth watering! Looks yummy! ! ! You’re really the best Sherrill! Looks So Yummy! I love apples and cinnamon sugar combination. Just a quick question. Is there any particular reason why the cut apples are not mixed with the cake batter and only layered? I did consider trying the recipe with the apples mixed in as well, but have yet to try it that way. As listed, the layers create a beautiful variety of flavors and textures. Feel free to experiment, I think it would be delicious either way. Can Golden Delicious apples be used instead of granny smith? 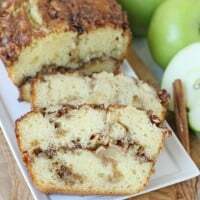 I almost always use Granny Smith for baking because they are a nice firm apple that holds up to baking without turning to mush. Golden Delicious I’m sure would work ok, but since they are are softer apple to start out with, once baked, they may loose most of their texture. Feel free to experiment. I made this last week and it was delicious! Reminded me so much of my Grandma’s coffee cake she always made. I do think I prefer recipes where you mix in the apples though because it helps keep the slice moist throughout. I also would add a bit of flour and butter to the topping to help it cook together a bit because much of it was still crumbly and fall off when I flipped the loaf out of the pan. Do you use plain flour ir selfrising flour? In the U.S., any recipe calling for “flour” refers to “all purpose flour” which has no leavening. Happy baking! 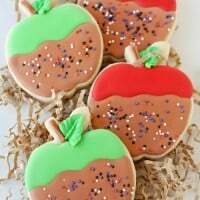 Could I use Honey Crisp apples for this recipe? 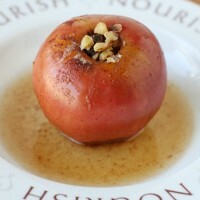 Yes, I think Honey Crisp would work perfectly well for this recipe. I’ve made this recipe a couple of times & it’s delicious!! I will be making it again for Thanksgiving & Christmas!!. 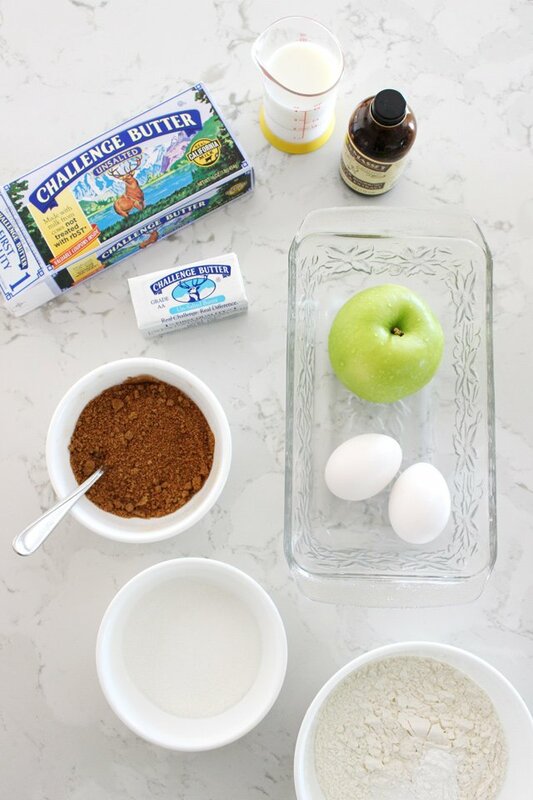 Is there any way to add the apples and cinammon mix to cake mix instead of making the batter from scratch? Sure. I imagine that would work fine. I’ve only made the recipe as listed, so I can’t be sure what your results will be. I followed the recipe exactly as it’s written but I added chopped walnuts. It was amazing! Could you double the recipe and make it in a bundt cake pan? Hi Linda, I have not tried to double the recipe (and bake as a bundt), but I do think it could be done. You’ll have to watch your bake time, it will take quite a while to bake, and you might need to gently cover the top with foil toward the end of baking so the top doesn’t get too dark before the inside is fully baked. Happy baking!